Homecoming Cham Syndulla, the hero of the Clone Wars and Ryloth, is called upon by his own daughter, Hera, to help the Rebellion steal a ship carrier. The only problem is that Cham has other ideas for the Imperial ship. Cham's Introduction. I really like Cham Syndulla. A lot of that has to do with the excellent novel by Paul S. Kemp entitled Lords of the Sith (if you haven’t you must read this book). In that novel Cham takes center stage in an attempt to assassinate the Emperor and Darth Vader. That background, along with the Clone Wars episodes he is in, helps us understand his background. Cham is an important figure and in a wonderful moment Kanan gushes over meeting him in a believable and funny way. Cham also has some strong emotional moments with his daughter, Hera, that adds much depth to the episode. Hera is the star of the show in my opinion. 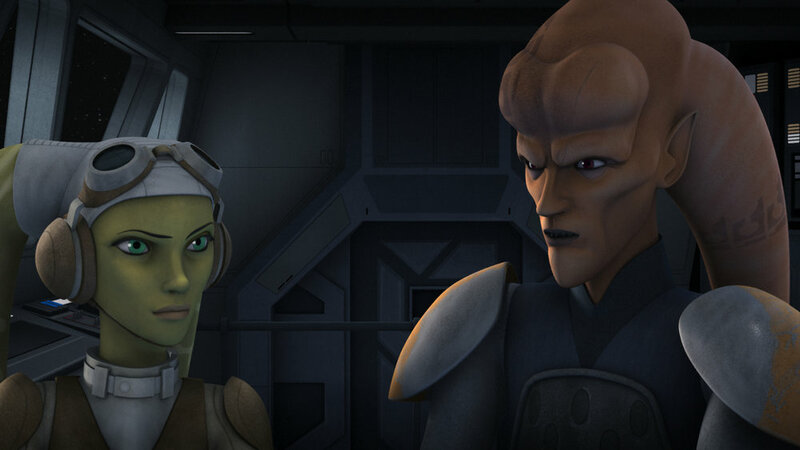 Vanessa Marshall’s work as the voice of Hera is nothing short of a revelation. There is a tense moment between Hera and Cham that Marshall does so perfectly I found myself amazed at the performance. One of the things that Marshall does is emulate the accent of Cham during an argument that they have, which added such nuisance to the scene. I loved it. Hera is, in many ways, the heart of the crew of the Ghost and having another episode focused on her was enjoyable. Again Kevin Kiner’s music is great. A highlight for me was a piece at the end of the episode that focuses on Hera and Cham as they struggle for control of the ship carrier. It was different than the typical John Williams styled music, yet it fit so well in the world of Star Wars. Kiner music is becoming a star of the series in my opinion. Excellent! While the character of Cham is such a dominate force in the episode, his motivation for what he does in it might be a little too hard for some to buy into. It is not a huge distraction to the episode, but for a character that seems so analytical, I did not completely buy into his motivation. Sorry to say this again, but the baddies need to push back at some point and push back hard. This season has been compared to the Empire Strikes Back. My guess is that the antagonists will come on strong these last episodes. Overall, it is a solid episode that adds even more depth to the wonderful character of Hera.